GILI MENO IS THE IDEAL NOTION OF A DESERTED ISLAND PARADISE. And no, you don’t need a partner to enjoy this ultimate paradise island. The island is perfect for families and solo travellers alike, seeking a perfect slice of island life, with a cherry on top. In our humble opinion, Gili Meno is The best Gili island worth visiting. Gili Meno has the finest white sand beaches in the Gilis, and the calmest, clearest waters, with just the odd fishing boat docked along the shore. In contrast to Gili Trawangan, Gili Meno is far, far less crowded. You won’t hear the thumping of loud music at night, well not from the island itself. You might hear the faint echo of dance music from the neighbouring islands (and late night party boats floating in the pitch black ocean). You might chuckle at the thought of wasting a beautiful balmy night in a floating disco. Then again, everyone has a different idea on what constitutes a fantastic holiday. Gili Meno is the best island in the Gilis for spotting turtles. Snorkelling boats from the other Gilis and Lombok are always floating between Gili Meno and Gili Air where the Meno Wall dive site is situated. Visitors have even spotted turtles while snorkelling just off Gili Meno’s shallow reef. What can we say, if Gili Meno is good enough for these timeless creatures, it’s certainly good enough for us. Gili Meno is the smallest and least developed island in the Gilis. That’s because the Lonely Planet started a rumor in the 90s that the saline lake on the island created mosquito problems. The rumour was not true, but scared off the crowds anyway. This turned out to be a blessing in disguise. 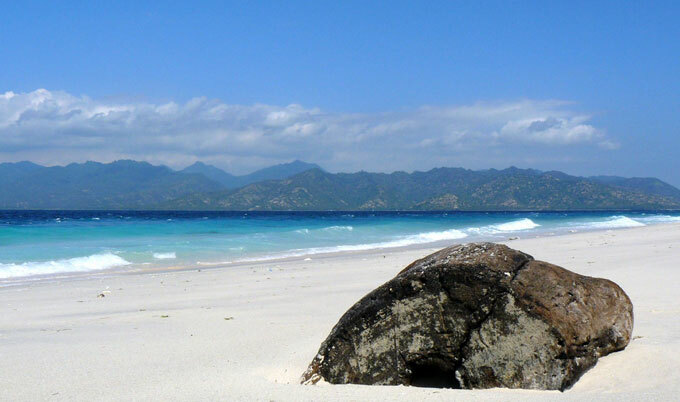 Today, Gili Meno is the most untouched and charming island in the Gilis. The beaches on Gili Meno outdo the beaches on the other Gilis — powder white and barely a tout in sight. Getting around the island is easy, all you have to do is walk. Like the other Gilis, you won’t find any motorised vehicles on the island. A leisurely stroll around the entire island takes less than two hours, or half a day if you wander into the heart of the island and stop to chat with the locals. This could be the best island getaway destination in Asia. It’s gloriously peaceful in Gili Meno. Within minutes of arriving on the island, you’ll feel yourself sink into a new dimension of relaxation. It’s out of this world. The worries of the modern life melt away instantly. You have to experience this for yourself, then you’ll see why we keep telling you: Gili Meno is The ultimate paradise island. 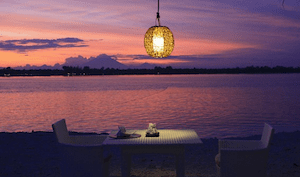 Gili Meno is the most family friendly of the Gilis, and a popular honeymoon destination. Nightlife is practically non-existent. The activities of choice are snorkelling, island hopping, diving, long walks on the beach, exploring the island on foot, reading on a hammock and splashing around in the sea. All top qaulity activities if you ask us. The calm and shallow waters and are safe for the kids, and the lack of TV means equals quality time with your loved ones. 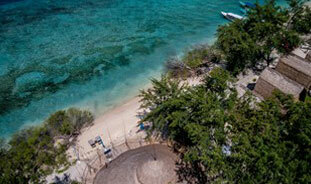 It’s also a great place for solo travellers seeking a Robinson Crusoe moment. The Reef Gili Meno. As close to the beachfront as you can get. Accommodation on Gili Meno is mostly beachside bungalows (around IDR300,000 – 500,000 a night). Budget accommodation fills up quickly, especially in high season. So book your accommodation before you arrive, or face a long and possibly fruitless search for a place to sleep. But if you’re after something truly special, then a stay in the island’s newest luxury resorts is highly recommended. The Reef Gili Meno is as close to the beachfront as you can get. While Karma Resort has ultra cool lumbung style bungalows and a chic beachfront spa and restaurant. Mahamaya offers the most romantic meal on the island. Mahamaya is the newest boutique resort on the island. The restaurant is highly rated, and utterly romantic, with tables right on the beach, and arguably the best sunset vista on the island. There are a deceivingly large number of warungs, restaurants and casual beach bars in Gili Meno for its size. Expect to stumble upon cafes that serve the usual combos of Western and Indonesian food, Sasak cuisine and ice cold Bintangs. The sunset bar next to Mahamaya resort is an excellent spot for a few casual beers in the early evening. We also recommend Ana Warung and Bungalows for afternoon beers and late night wines; where you can have a tipple on the viewing deck and chat with the friendly owner and other travellers who gravitate towards the warm, communal vibe of the place. There are no ATMs on Gili Meno, so bring enough cash for the duration of your stay. If you run out of cash on the island, Blue Marlin will give you a credit card cash advance and slap you with a commission fee of 7%. The other option is to hop on a local ferry to Gili Trawangan where there are plenty of ATMs. Internet connectivity on Gili Meno is good enough to check your emails and get on Facebook, but it’s really a place to switch off completely and make the most of your time in supreme paradise.